Rare working blueback nautical chart of Cuba! This stunning blueback nautical chart or map of Cuba, issued by James Imray in 1854, has all of the hallmarks of a working shipboard chart and a life at sea. Centered on Cuba, the map covers from Key West (Florida) to Grand Cayman, and from Cape Antonio (Cuba) to the Inagua Islands (Bahamas), coving all of Cuba, and parts of the southern Bahama Islands. 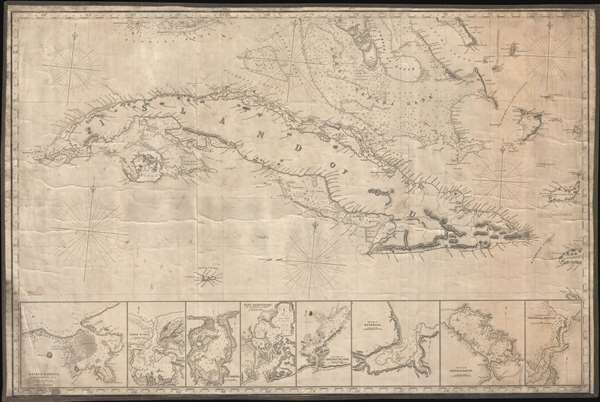 Along the bottom of the map there are eight detail sub-maps, including, from left: Havana Harbor, Bahia Honda, Port Mariel, Port Guantanamo (Guantanamo Bay), Santiago de Cuba, Matanzas, Juaga or Zagua, and the Entrance of Puerto de la Nuevias. Some marks in pencil in the Old Bahama Channel or Santaren Channel (Bahamas) indicate navigation use. Soundings, particularly on the south coast of Cuba and throughout the Great Bahama Bank are in fathoms. Like many blueback charts, this map is extremely rare with the OCLC listing no other examples. This map is owned jointly by Geographicus and Vetus Carta Maps. Good. Working nautical chart, exhibits pencil marks related to navigation, come cracking, overall toning, staining in corners. Original blue paper backing, brown linen edging.